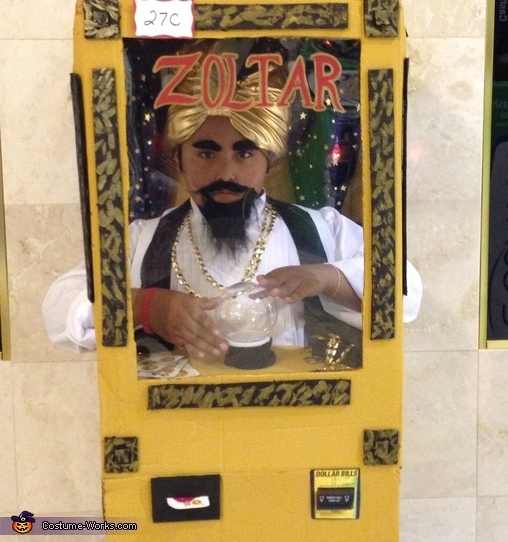 This homemade costume for boys entered our 2014 Halloween Costume Contest. My 11 year old son Rolando Rivera is wearing the costume. We were inspired by the movie BIG. We used a box for the machine and painted it gold, clear poster board for the glass illusion, an ornament for the crystal ball, we put some led lights in the box to light it up. The crystal ball also lit up with an led light that we took from a fake candle from dollar tree. I bought him a turbine and fake stick on mustaches and beard. His shirt and vest I found brand new at a goodwill store. I made the border pieces out of cardboard and just painted them black and gold. We painted a little wooden treasure chest and filled it with fake gold coins and gold chain. We glued tarrot cards next to the crystal ball. He was a hit everywhere we went, we hope u enjoy it! !